Hello to everybody, it is a pleasure to share with the forum the progression of one procedure, performed last May 2009 at the HDC clinic in Cyprus. The patient are in his 6 months post-op stage, he still have in front another 6 months of evolution during which the result will improve in terms of growth and naturalness, this is well known by all of us, anyhow the patient are happy with how it evolves, we are in touch and I will keep the case updated. 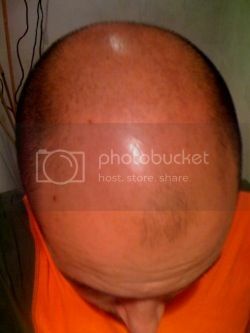 check out his before picture, he looks fine even without a hair transplant, if I were him, I would only do 2000 max. » if I were him, I would only do 2000 max. His previous look was the result of one year of Finasteride and Minoxidil, he was more bald two years ago, I will try to find some pic. Well 2.000 seems not enough for this case, at least not to reach his expectations, specially if we consider that he prepare to come back for a second procedure for the crown, to cover the rest of the area that wasn’t covered in this first procedure. I hope things turns out well for him. My loss is almost identical to him, except my temples are more receded and I’m 24. Hasson/Wong and an Armani rep both said I was not a very candidate (H/W flat out said it’d be a bad idea, Armani rep said I had below average hair characteristics) but this looks like a good start. Can you tell us anything about his donor quality? In this case the surgery was viable, 34 years old, plus one year of treatment with Finasteride and Minoxidil make him a good candidate for the surgery. The density of his donor was a little bit above the average, around 90 grafts per square, this make possible to reach the amount, 4.300 grafts FUE in one session, the next step it will be a second surgery to cover the remaining area, the crown, another 3.000 grafts are available from his donor without any problem. This photo show the situation one year before the treatment with Finasteride and Minoxidil. » donor without any problem. escar, how important it is to get on Fin before and after HT? Is it must to get on Fin if you want good results after HT? It’s amazing what finas and minox did for him, anyone who doesn’t give this a try before considering hair transplant is a fool. Do you have 3 months or longer pics of his back after 4300 grafts ? How many more do you think you can get from his donor without making it look unnatural? I will post some new photos soon when the patient take new ones, including the donor. Concerning the donor the patient plan to come back to HDC in a couple of months to do more job for the crown and complete the restoration, we were talking about 2.000-2.500 grafts to do this but we will concrete after examination in person, the objective is to keep the donor and the extractions completely undetectable after the two procedures. is it any surprise he has a good result? » is it any surprise he has a good result? I concur. As you well know this is typical. Now the next thing posted will be that I’m a shill for another clinic. This is a typical response that wouldn’t be necessary if the “proof was in the pudding.”. At least the angles the pictures were taken and the lighting was the same, but then again, no need to not have them the same when the patient still had pretty much a full head of hair just shaved down short. Wait a minute, are you telling the people here that this guy had 95% of his hair?, if yes then you should check again more thoroughly,this guy was NW6 two years ago, then after the treatment with Finasteride and Minioxidil he recovered some hair, specially some vellus hair but far away from get 95% of his hair back because this hair doesnt produce coverage or density, but helps when add more hair like in this case to produce much better result in terms of density and coverage. On the other hand it looks like you disliked that the patient has obtained a good result, I do not say that you are unhappy with this, I just say that it looks like. » » is it any surprise he has a good result? » I concur. As you well know this is typical. » Now the next thing posted will be that I’m a shill for another clinic. » patient still had pretty much a full head of hair just shaved down short. What is a classic its you criticizing all the results that doesnt come from Dr Umar, this is a classic. Also you should check again more thoroughly the case and pay attention also to the explanations not only to the photos, you will be surprised. » result in terms of density and coverage. To be honest, I haven´t seen many cases of +4000 grafts FUE with impressive results. » from Dr Umar, this is a classic. » also to the explanations not only to the photos, you will be surprised. Actually back in July of 2009 I made reference to one of your clinic’s results that you posted in which the results were very pleasing and the before and after photos were very equitable. I don’t have to cheerlead any clinic or its results because, just as inequitable before and after photos (and the reasons they are posted) should be more than obvious to anyone with half of a brain, photos posted to the contrary lend credibility to the doctor and the clinic. When you house mice come on this forum on behalf of the clinic you work for and post inequitable before and after photos it damages and destroys your and your clinic’s credibility. » » from Dr Umar, this is a classic. » » also to the explanations not only to the photos, you will be surprised. » before and after photos were very equitable. » to the contrary lend credibility to the doctor and the clinic. » your and your clinic’s credibility. Thank you, fortunately our reputation are very good and we are very well considered not only by the photos posted on forums but due to the comments and degree of satisfaction of our patients around the world, all of them satisfied customers, this is our objective, provide the best possible service and care to the patient.